Ah, Pride and Prejudice … it is the classic book that keeps on proving to be fertile ground for other writers to grow their own stories. I’ve read many a P&P spin-off. Some good. Some downright terrible. But never have I read a book quite as clever as this. It’s such a good idea, I wish I had of thought of it. In Longbourn by Jo Baker, the characters we know and love from Pride and Prejudice take a backseat. This is the tale of the servants who wait on their every whim. The servants who scrub the mud off Elizabeth Bennett’s shoes after she goes traipsing through the fields. The servants who deliver all the letters for the family, clean the undergarments of five young ladies, worry about their future after Mr Bennett dies and Mr Collins takes over the house, and put up with the moods of a very passionate family. I guess you could call in a cross between P&P and Downton Abbey, but I don’t believe it is trying to be a gimmick. It is simply a very good, very clever story. Much of the book is told from the point-of-view of Sarah, a maid who was rescued from the poor house by Mrs Hill, the housekeeper, and brought up to see to the needs of the household. There’s also a young girl called Polly and the old Mr Hill working in Longbourn. Sarah’s whole world is Longbourn and unlike the privileged girls upstairs, she wonders if she will ever get to experience anything in her life. And then along comes James Smith – a young man with a mysterious past and someone who Sarah doesn’t like or trust on sight. Although he is a hard worker, she wonders where he came from and what he is hiding. With the arrival of Mr Bingley and the opening up of Netherfield, Sarah meets an exotic footman of Mr Bingley’s who may offer her the escape from drudgery she has been searching for. 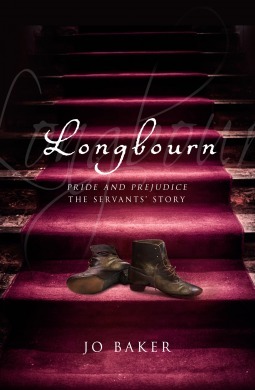 What does Mr Collins arrival mean to the Longbourn servants? And how does Elizabeth’s refusal jeopardise them? We all know what a cad Mr Wickham was and how he favoured young girls. What happens when he visits Longbourn? Why is Mrs Bennett the way she is and does Mr Bennett have a reason to feel guilty? Whilst the girls go off to balls, how is a household run during this time – especially on a budget. Taking care of the laundry of five young women is no easy task! Lydia and Kitty love the militia but P&P mentions little about the war that is being fought at this time. Longbourn tells the reader more about the realities of this time for those in the army and those less privileged. I found this book rich in its characters and content. It is part ode to P&P, part history lesson in the realities of the time, part suspense and also a love story. Though I love Mr Darcy, here he is no more than a stern, slightly terrifying stranger in the parlour. I was a bit sceptical picking this up as it reeked of gimmick, but I’m glad I did. You’re welcome. I hope you can get it for your birthday 🙂 I’ll be interested to read what you think about it. Is it available only as an eread? I’m intrigued. Sounds a bit like Guildenstern and Rosencrantz Are Dead in format. It’s available in Australia in book form. Not out in the US as a book until October, but available in the UK. Whereabouts are you located? I’m in the States, and used to waiting for my literary fancies to eventually find their way over. We have a wonderful local library who keep up on the latest releases. Let me know what you think once you’ve read it! Not another P&P story! Goodness me. I never know what to think when I see a book that is sort of a sequel to or based on another that is by a different author. Is it presumptuous of them to think that they can take a classic and do justice to something like P/P? Could the author have written about the servants in a home around the time that Pride and Prejudice takes place instead of writing about that particular household?